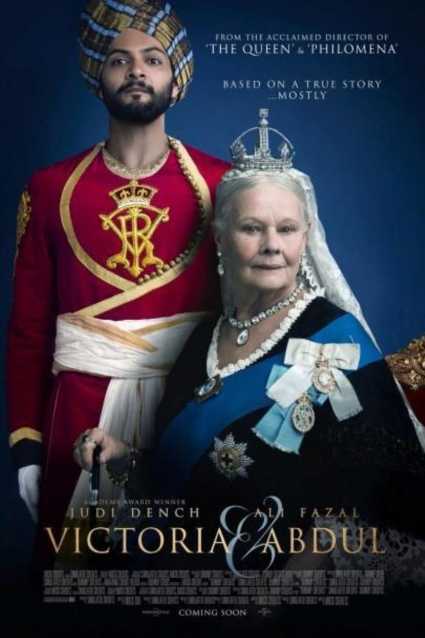 Judi Dench and Ali Fazal harmonize superbly well in this cinematic correction of an almost obliterated, salient fact in the life of a racially and culturally –open, earthy queen whom sphincter-clenched historians have attempted to keep in a time-antiseptic closet. They have failed miserably. We know Queen Victoria mainly as the full-figured, stodgy matron, after whom a superficially conservative era was named. The real Victoria was not stodgy. Neither did she share the limited, racist mentality of the wooden, cloying figures who constantly surrounded her. Quite to the contrary, Victoria and Prince Albert produced nine offspring. We know of the queen’s subsequent association with the amiable, Scottish gamekeeper John Brown, with whom she formed a close, ambiguous relationship. When she was still the new, teenaged queen, Victoria brought a young, orphan-girl from Africa, and generously shared her life and palace with her. What was almost obscured in history is the fact that this very down-to-earth monarch chose to spend the last sixteen years of her life in the personal company of a young Muslim from India, with whom she studied Urdu and the Koran.. Most importantly, Victoria was able to ease out of life upon the comforting cloud of shared humanity. • Courtiers were sotto voce discussing the queen’s attachment to Ali. One of them says, “He is somewhat a brown, “Brown.” (Reference to Ali’s coloring and the then-late Victoria-favorite John Brown. Subscript: Although this film covered only Victoria’s latter years, it is notable that, as a young queen, she encouraged Prince Albert to take up with Parliament the abolition of chattel slavery. I so love how you exposed the untold story of the browning of Victorian England (I know she didn't have kids with him, but I'm talking about the temporal spirit of browning). I can't wait until it occurs across the planet, which I won't see in my lifetime, but which will beautify the planet towards truly solving an ancient tribal dilemma, now one of the globe's major nightmares.